In the early 1990s, Claude Monet acquired a part of a meadow, measuring 7,500 m2, not far from his home in Giverny. This site, with the help of a small canal, he turned into a wonderful water garden. Later in the garden was built an arched bridge. The artist has acquired peace there and a place for reflection. In October 1890, Monet had a desire to write his favorite place in a series of types of poppy fields. After the artist finally settled in Giverny, he created a series of paintings dedicated to the Japanese bridge. Then Monet moved to the water lilies in the pond and began writing from at different times of the year. He showed his series “Water Lilies, Landscapes of Water” at an exhibition in Paris in 1909. 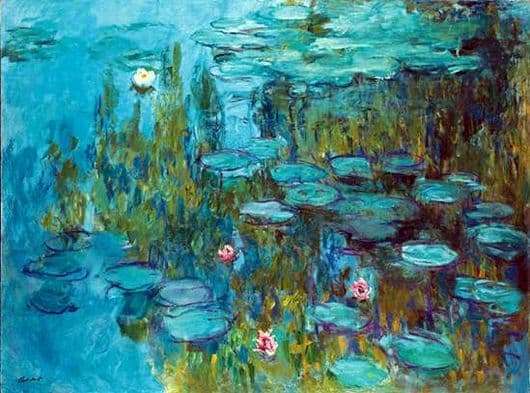 But after that, he did not finish his work on water lilies and looked for more and more new images for himself, creating large-sized canvases. From 1897 to 1919 a series of paintings was created ” Lilies “. One morning, Monet looked at the pond and saw” nothing “there: the reality of long use was erased, and dissolved into insignificance. After that, the artist locked himself in his room and began to create an image of lilies from memory. Slightly exaggerating small details and giving his creation all the necessary amount of warmth, Monet created a wonderful picture “Water Lilies.” On it we can see, animated by the rays of the sun and a pond covered with light ripples, overgrown with algae and surrounded by weeping willows. Colonies of lilies shining in the sun lay like pearls. Amazingly, the picture does not have a horizon or sky, it can only be seen in the reflection on water.